An educational, entertaining and exciting way to explore our rich maritime history… and it comes with a fabulous view! For four decades, the Door County Maritime Museum has educated and entertained the public while working to preserve rich maritime history. 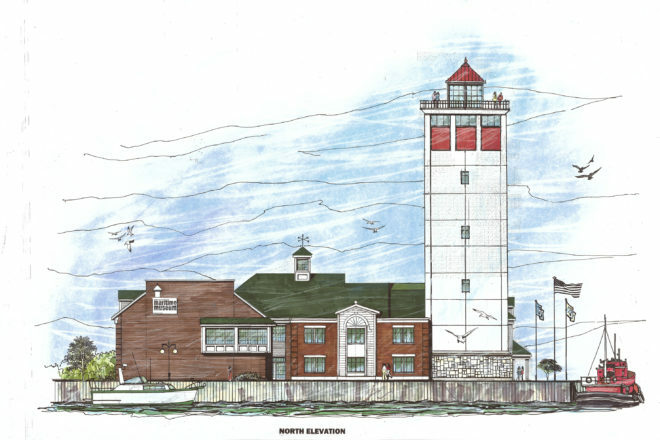 Now the museum is taking a major leap forward by expanding its Sturgeon Bay facility with a spectacular 10-story Maritime Lighthouse Tower right along the Sturgeon Bay inner harbor. • Ten floors of creative, interactive educational displays that feature many highlights of our maritime history, people and industries. • Convenient accessibility to a lighthouse experience that will accommodate everyone regardless of physical abilities. • Meeting and convention facilities available to host events and special occasions in a very unique venue that can include the top two floors of the lighthouse tower. • An indoor all-weather 10th floor observation floor that will be open all year. • An outdoor 11th floor observation deck open seasonally to offer amazing vistas over the entire harbor of Sturgeon Bay from the top of the lighthouse tower. • A must see, must visit multi-faceted maritime experience that will draw visitors to our area from far and wide and bring people back many times over. • An intriguing destination that will generate tremendous interest and activity and create a huge economic boost and many related benefits to the entire area. • Educational experiences that will teach young and old, keep our history alive and help to promote interest in maritime related career opportunities. • The ultimate creation of an iconic landmark for Door County in the likeness of the Gateway Arch in St. Louis or the Space Needle in Seattle! • View the informational video and review the online brochure. • Consider the numerous donation and pledge opportunities to help support this effort. • Please make your most generous contribution to help make this very special tribute to our maritime heritage a reality! We, the Staff and Board of Directors, and the Door County Maritime Museum and Lighthouse Preservation Society sincerely thank you for your interest and participation in this iconic project!